Bacopa monnieri is commonly known as waterhyssop, water hyssop and brahmi after the Hindu God – Brahma. It is a perennial herb with medicinal qualities found in wetlands in various parts of the world including Asia, Africa, Australia, Europe and South America. 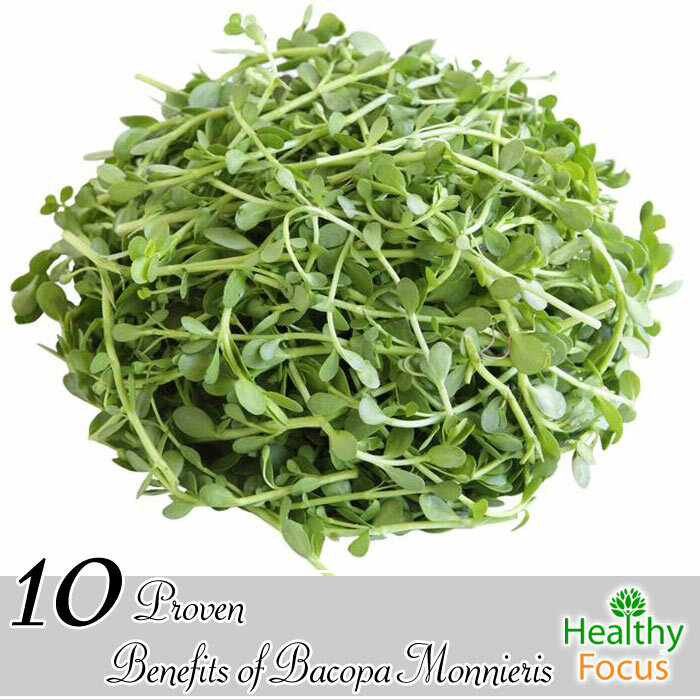 Bacopa monnieri has an extremely long history of medicinal use especially in Ayurvedic medicine where it has been used for various brain disorders. It is a popular natural treatment for epilepsy, ADHD, memory loss, anxiety and even Alzheimer’s. It is also used to treat asthma, anemia and inflammation. But that is not all, when it comes to health, bacopa can tick off a wide variety of boxes as you are about to discover. We mention antioxidants a lot on this site and for good reason. It is vital that we get enough natural antioxidants into our systems to maintain good health and protect against disease. Fortunately, nature provides us with a variety of natural options and research has shown us that bacopa monnieri is a great choice. Stress is becoming more of a concern in today’s modern world than it has ever been. Not only does stress take its toll on the mind and the ability to function from day to day but it is also a huge factor in various physical conditions. Little wonder then that people are desperately seeking a natural alternative to the powerful and potentially harmful pharmaceutical options on the market. Bacopa monnieri is one potential option. According to research done on animals, it has the potential to relieve stress naturally putting you in a better frame of mind without the worry of dependency and other side effects. In the same way that bacopa monnieri can help reduce stress, it can also help to treat the crippling symptoms of depression and anxiety. Researchers in Michigan found that an extract of the herb had a very positive effect on the brain activity of rats and could potentially help to treat both conditions. Some promising research has been done into the effects of bacopa monnieri on memory. In one small scale Australian study, researchers treated volunteers with either 300 mg of the herb each day or with a placebo. Prior to the beginning of the three-month long experiment, all the participants were tested memory, visual ability and processing speed. These tests were repeated halfway through the experiment and at the conclusion. The researchers found that the volunteers who took bacopa had significant improvements in all tested abilities when compared to the placebo group. The bacosides found in bacopa which are responsible for its cognitive improvements may also play a part in treating attention deficit disorder. This is a chronic condition which begins during childhood causing a child to become hyperactive and impulsive and unable to focus on schoolwork. Other experiments have been inconclusive and more work is needed before we can say with confidence that bacopa can help treat epilepsy. Millions of people around the world are suffering from chronic pain. Unfortunately, over three quarters of people who have chronic pain are also suffering from a form of depression. Studies have demonstrated that bacopa monnieri is a safe and effective treatment for various types of pain. While bacopa is certainly most lauded for its abilities to treat the brain, it can also help cleanse the liver of toxins. A study on rats published in 2010 found that bacopa extract could help improve liver function after the organ was damaged by toxins. (11) This suggests that bacopa could be a useful detoxification tool in humans. Like moist herbal medicines, bacopa monnieri is available in various forms including tea, powder and capsules. If you are going to take bacopa supplements, be sure to read the dosage instructions clearly and make sure that you buy from a respectable source. Bacopa tea is a great way to gain all of the herb’s benefits and is a great alternative to your regular tea. It has a slightly bitter flavor so you may like to add some healthy honey to make it more palatable. To make your tea, simply add a couple of fresh leaves or a healthy pinch of the dried leaf to a cup of boiling water. Allow the leaves to steep for at least ten minutes, strain and drink up. If you can get the fresh leaves, there are studies that indicate they contain more saponins than the dried version. Bacopa monnieri is considered safe when it is taken in the recommended dose for a short period. There are no serious adverse side effects linked to recommended doses but minor side effects include bloating, diarrhea, nausea, fatigue and cramping. Because of its mild sedative effects, you should be careful not to combine bacopa with other sedatives. Always consult your doctor if you are concerned especially of you are pregnant or have a preexisting medical condition.